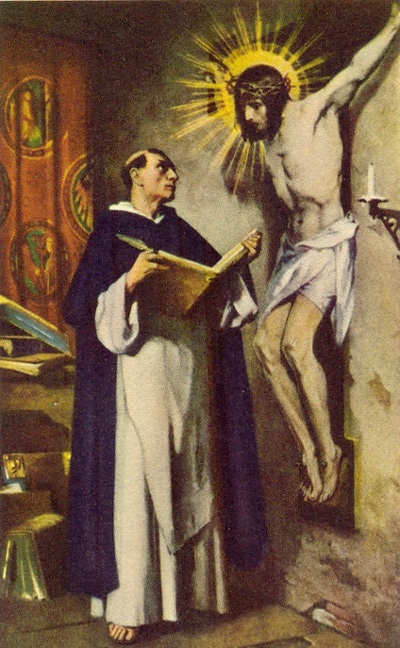 Today is the Feast of Saint Thomas Aquinas. He was the greatest and most prolific theologian of the Church. He stands at the head of the Doctors of the Church. For all of his learned writing, for his Summae, which were standard texts for centuries, Thomas had a vision one day while saying Mass that changed him. His vision, he said, made all that he wrote seem as so much straw. He never wrote again. What glories, what love did Thomas see? As Said Paul tells us, “Eye has not seen, nor ear heard, the glories…” that await us in Heaven. The revelation given to Thomas came through his focus on Jesus’ sufferings on the cross and his saintly imitation of them. From today’s Liturgy of the Hours, Office of Readings. An inspiring story. Although there are, in the summae, some observations I appreciated, it seems that the message God gave to us through Aquinas, in the end, is that all the writings of all the doctors of the church are merely human, and therefore not particularly authoritative in matters of the spirit, so keep it simple, and look forward to the day when we will all see what he saw. Until then, there is nothing like it on earth.